Slavka Jovanović, 50, London, was born in Shipley, West Yorkshire to Serbian parents. Art has always featured strongly in Slavka’s life in a variety of ways with the support from her incredibly creative family. With her father who is a poet in his spare; Slavka remembers he would sit at his typewriter tapping away into the night. A mother, a craftswoman who was always working on a new project – whether it was dress-designing, embroidery, cake decorating. Slavka and her two siblings inherited a talent for art, however as children of immigrants it was not seen as a serious life choice so the children were discouraged from pursuing their dreams as artists and designers. After training to be a teacher (at her parent’s request), Slavka ran away to London to join the theatre and has been working in theatre and arts education for most of her life, her career as a visual artist took off about 12 years ago. What motivated you to deal with the subject of women’s issues and identity in your art? I see that there is a tremendous pressure for people to conform to society’s norm, whether male or female. As a woman, I have observed this on many occasions. “Falling Apart And Keeping It Together At The Same Time” is a 1 minute stop-frame animation which succinctly demonstrates the monotony of being a house wife and the desperate need to keep up appearances as her world falls apart. On first viewing it’s a humorous piece but the more you watch it the more poignant it is. I chose this film because I am fascinated by the compulsion many of us have to hide our feelings, to tell everyone that we are “fine”, when, in fact, our world might be falling apart. We are terrified of letting the outside world glimpse any aspect of our interior selves. This film has moved people who have watched it in the past and opened up discussion around themes of isolation, well-being and expectations. “Her Story” is a 5-minute stop-frame animation telling the story of a young girl who has trouble sleeping and has to get to the root of the problem. On the surface it’s a simple story and it’s narrated in a story-book style, however there are powerful themes within the tale that have resonated strongly with people. On the surface themes of insomnia and hyper-sensitivity, moving to isolation/loneliness, and even more deeply to depression and schizophrenia. I like this film for the very reason that it has the power to connect with the viewer in different ways and is entertaining as well as thought-provoking. I have chosen the medium of filmed animation for these two pieces of art because it helps to portray the message in a clear and effective way. My process involves collect thoughts, experiences and feelings from a number of sources over many many months. I tend to work on several projects at one time, exploring themes connected to each project in different ways/media. For example, “Falling apart and Keeping it together at the same time” is a theme that I had explored through collage and through sculpture in the 3 years leading up to making the animation film. I keep returning to the theme of façades and keeping up appearances/wearing masks/adopting persona’s/containing oneself. I love the work of Louise Bourgeois, Annette Messager, Tracy Emin, Hannah Hoch and Frida Kahlo. I also like the animation work of Lotte Reiniger and Jan Svankmajer. I like live animation presented by Nic Rawling from The Paper Cinema, and Matthew Robbins. Feminism is about choice. As a woman it is the right to choose one’s own way in life and being respected by those around you for that choice. It is also about education and awareness. It’s about you, as a woman, having the knowledge and learning from which to be able to make choices. It’s also about choices being made available to you. Art is a powerful medium and a perfect way to put across a message or express deep emotions. 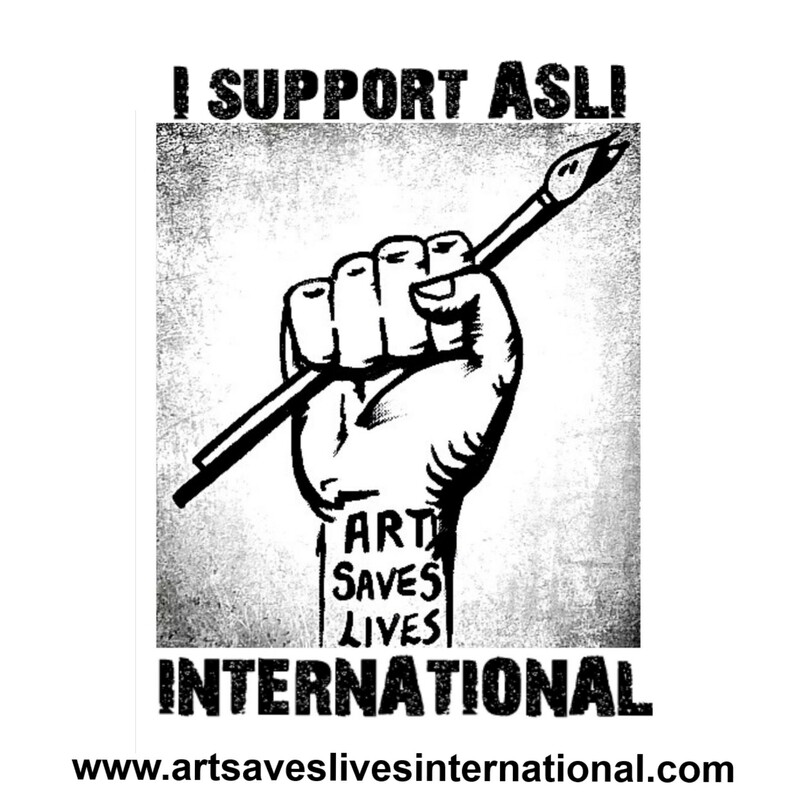 I admire the ethos of Art Saves Lives International in supporting the artists voice and sharing important work. I feel it’s a tough world all round – whether you’re a man, woman or child. I feel that society places extraordinary demands on the individual to conform to the norm. I also think that the so-called norm is becoming more extreme, whether it’s in politics, religion or advertising. We are all being controlled and told what to think, what to wear, how to look, how to behave. Social media and the media at large don’t help the situation as both are tools that are used to indoctrinate us, formally or informally. Personally, I haven’t been overtly affected and am able to live my life in the way that I wish, making the choices that I want to make but I am very aware that many women do have a much harder time than me. I am passionate about disability issues, especially around autism. Much of my time is spent campaigning about this and making positive creative opportunities for people on the autistic spectrum. I am also passionate about mental health and well-being. I campaign against stigma relating to mental health. Finally I campaign for equality, especially around opportunities for women. Art Saves lives means that art is a lifeline. It can connect you to others who have similar experiences, it can give a strong message easily, it can allow you to express your self (either as an artist or as a viewer). Art allows me to explore difficult thoughts and feelings. My art creates change by connecting people with their own difficult thoughts and experiences. It also puts women at the centre of the narrative and gives them a voice. I didn’t set out overtly to create change on an international level but I do know that my work has affected people on a very personal level and has opened up channels of discussion. My goal is to share stories that will resonate with others and make them feel less lonely and isolated. I am continuing to explore women’s roles (through collage and paint) by creating religious icons and “beatifying” women that I admire or archetypes that I feel deserve to be elevated to a higher status through representation in art. I am currently working in collage, found objects and paint. In another project I am working with puppeteers, musicians, storytellers, and dancers to animate a sculptural piece of work that consists of a dining table with cracked and broken crockery. We will explore the story within the story. What would it say if the table could talk?